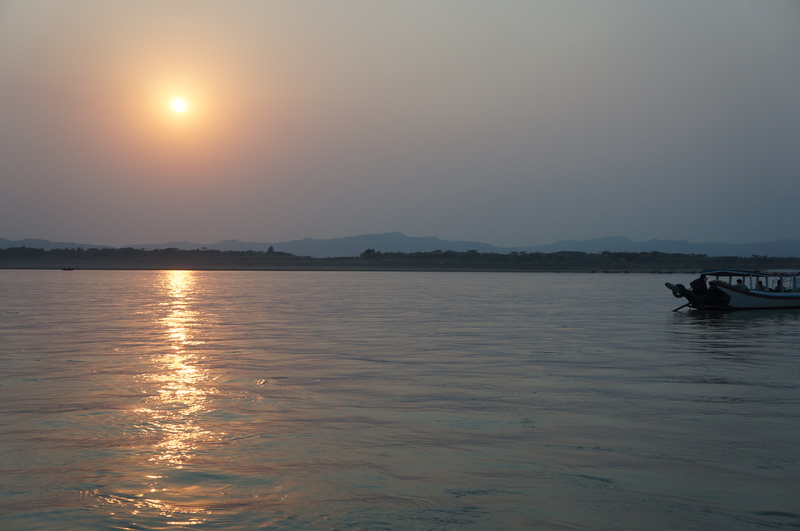 I’m back… And yes, Myanmar is amazing! A picture is worth a 1000 words. I have so much to say, I’m just going to surrender and go with the snapshots. For the more in-depth stuff … wait for the short stories. The Ayeryawaddy is the lifeline of Myanmar. Starting 1,300 miles up in the Himalayan Range, it runs through Myanmar’s jungly and strife worn Northern regions to the hot and dusty plains of Central Burma before reaching the Andaman Sea just East of India. 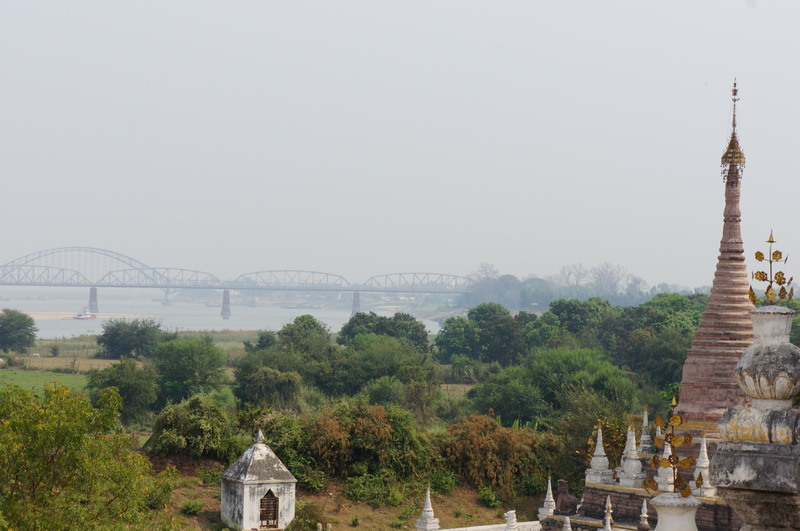 We met the river at the Ancient Capital of Bagan. Here’s the view of the river from a restaurant we had lunch at. Bagan was first settled in the 2nd century by the Pyu people, the earliest inhabitants of Myanmar with a extant records. 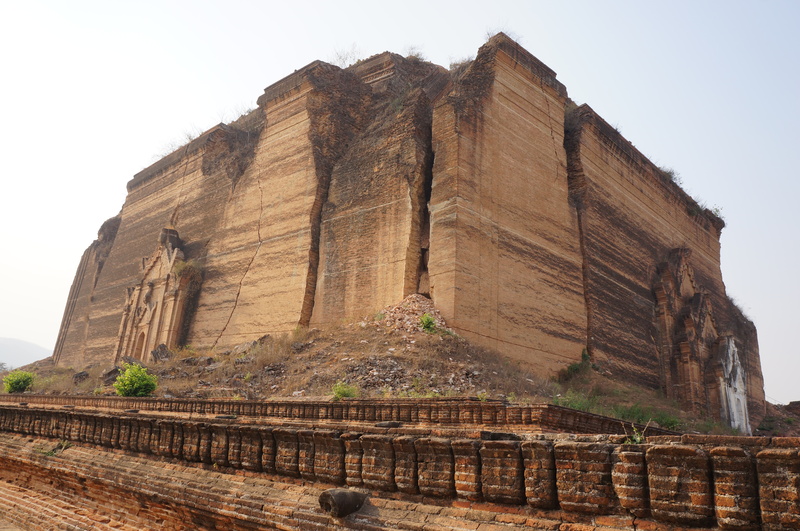 The only Pyu temple left in Bagan, on the banks of the Ayerywaddy, is pictured below. my next post. On our journey up the Ayeryawaddy however, what’s important about Bagan is that the civilization there collapsed due to repeated Mongolian invasions into Upper Burma. As a result, the center of power moved to Sagaing, a hilly region further upriver, surrounded by three banks of the Ayeryawaddy and with a commanding view of the North Eastern plains from which the Mongolian horsemen might be expected to come. 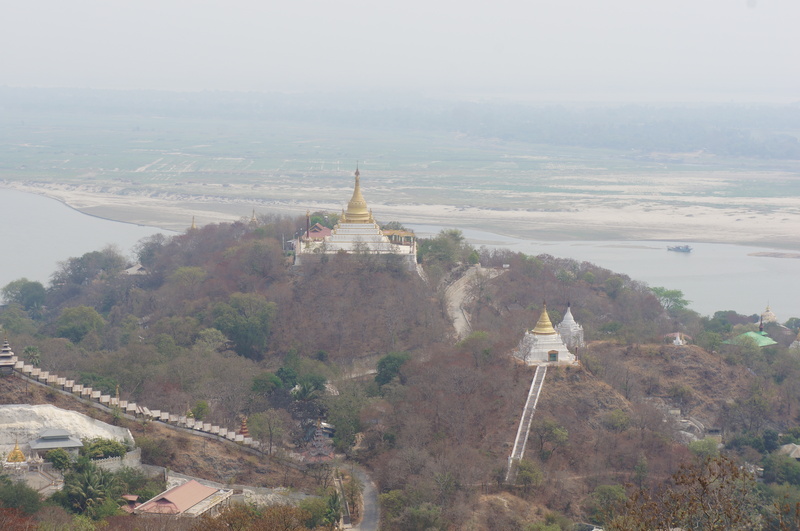 Here’s a picture of Sagaing and its wonderful location! River and surrounded by 7 lakes and the rice-fields of Kyaukse. The Konbaung Kings were a lusty lot with many wives and sons. Succession was always a problem. The years the Konbaung were based at Innwa, were also years of bloodshed, coups and counter coups. Many a would-be king would murder his uncle or brother and then establish a new city up or down river. And as with Johnny-come-latelys everywhere, most of them built monument to bolster their egos. 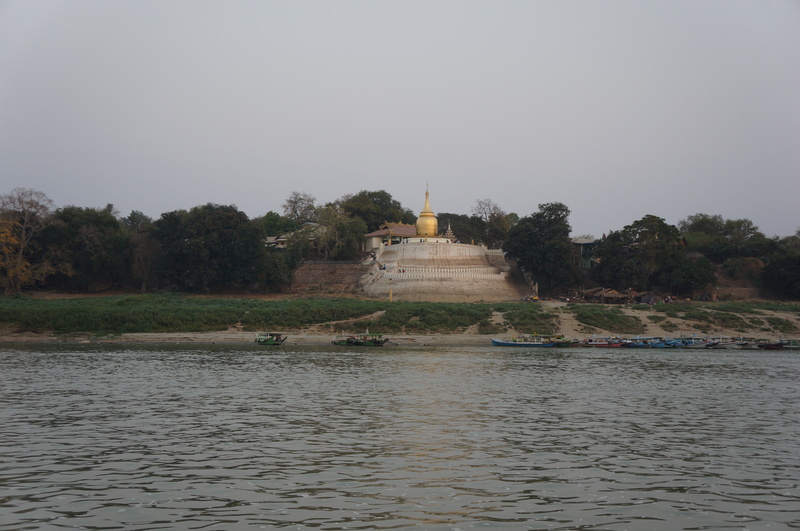 In Mingun upstream of Mandalay, Bodawpaya, the 4th son of the Konbaung founder, began building what was to be the largest pagoda in Myanmar. However, because soothsayers predicted that the dynasty would end upon completion of construction, the building was abandoned. Here’s a picture of the enormous mass of bricks, just 20% of the actual planned pagoda. I felt quite melancholy staring at the waste. I could imagine the amount of labour, involuntary coerced labour in all probability, that had gone into that pagoda base. someone who’s gotten to be top dog by killing his relatives needs the merit. meaningless our human ideas of success are. In any case the Konbaung did not last. Bodawpaya’s son lost Tennaserim to the British in 1824. By the time the capital was moved to Mandalay, on another part of the Ayeryawaddy in 1857, Lower Burma including Yangon had been annexed. In 1885, the British marched into Mandalay, the last king Thibaw was sent away to exile in India and the whole of Myanmar became a British colony. The British finally left in 1948. What remains is the bridge they built across the Ayeryawaddy in 1937. What remains in the end after the centuries of kings, the years of colonization, the further years of solitude is the river and its sunsets and sunrises. And even that too will pass. Look on my works, ye Mighty, and despair!” Human history has a common theme in every land, the rise and fall of power. But the one true God is always on His throne. Ah yes, the Shelley. Those were the lines running through my head for quite a lot of the trip. Audrey – your photos are amazing. I especially like the one of the sunset over the river. Interesting to learn a little of the history of Myanmar. You comment here touched something in me, “What remains in the end after the centuries of kings, the years of colonization, the further years of solitude is the river and its sunsets and sunrises. And even that too will pass.” Saddens me, somehow. Glad you like them Joan. It sure is something different from what we’re used to isn’t it. Watch out for the rest of the series … probably another 3 posts at least. A walk back in time and then into the present, beautiful and sad but there is always a sunrise and a hope that man is learning, constantly learning and changing for the better. Thank you Audrey for taking us with you on this trip. Thanks for this wonderful armchair travelogue, Aud – love the sunset picture.